So..... I've been off the blog radar for a while and tweeting lots about feeling under the weather and being hungry and tired. Yep, you've guessed it! 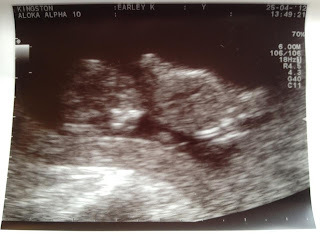 I am very excited to announce that we are expecting baby number 2 and that he or she is due in early November! My twelve week scan was last week. Here is a first glimpse of our little monkey. Not the clearest picture as he or she was misbehaving (already!) but of course I blubbed, because I'm a complete hormonal wreck. Congratulations! I loved being pregnant too, it's just the best feeling isn't it?